Ovid closed Book 8 of his Metamorphoses with a teaser: he told us how Achelous, the river god, was able to transform himself into a snake or bull, and that he has recently lost one of the bull’s two horns. The opening myth in Book 9 explains what happened. With a little prompting from Theseus, Achelous resumes the narration, lamenting that he is going to tell a story of a battle lost. Both Achelous and Hercules asked for the beautiful Deianira’s hand in marriage. Other suitors resigned their claims, and left it to those two to plead their cases. Hercules was not happy doing this in words, and rushed at Achelous, engaging him in a fight. Achelous gives a flattering account of the pair wrestling, eventually admitting that Hercules got the better of him, and forced Achelous onto his knees. The river god then shifted shape, first to a snake so that he could slither away from his opponent. Hercules mocked him, reminding him of his conquest of the Lernean Hydra. Achelous’ missing horn was transformed into the Horn of Plenty, cornucopia, and the guests were then served fruit in such a horn at their banquet. This leads Ovid on to a series of myths about Hercules. For once, I start with an exquisitely engraved rock crystal plaque, with enamel and gold, by Annibale Fontana. 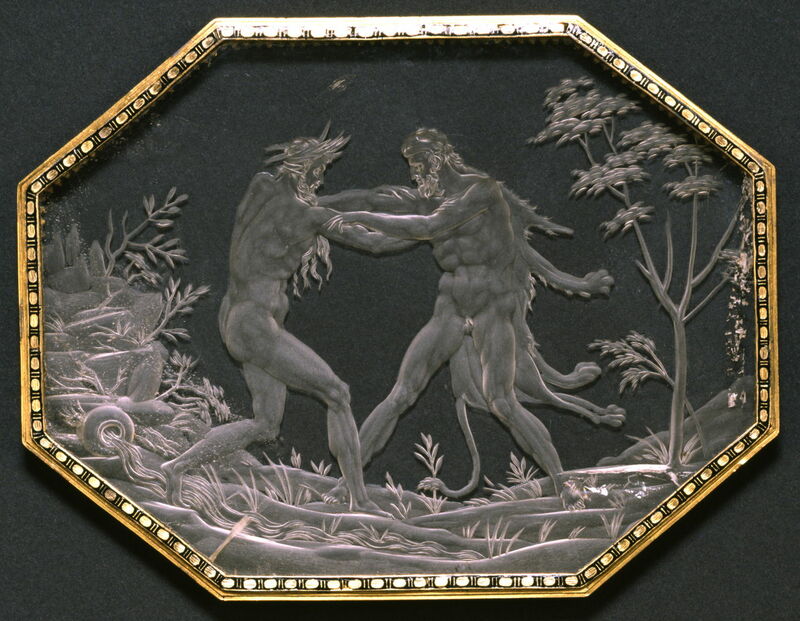 Annibale Fontana (1540–1587), Plaque with Hercules and Achelous (c 1560-70), rock crystal, enamel, and gold, 10.3 x 13.3 cm, Walters Art Museum, Baltimore. Wikimedia Commons. This depiction of Hercules and Achelous wrestling is one scene from the life of Hercules, which was originally set with others into a gilded casket owned by the ducal Gonzaga family, of the city of Mantua in Italy. Hercules, on the right, wears his signature lionskin, and Achelous is conventionally old, bearded, and shaggy. Cornelis Cornelisz. van Haarlem (1562-1638), Hercules and Achelous (?1590), oil on canvas, 192 x 244 cm, location not known. Wikimedia Commons. Cornelis Cornelisz. 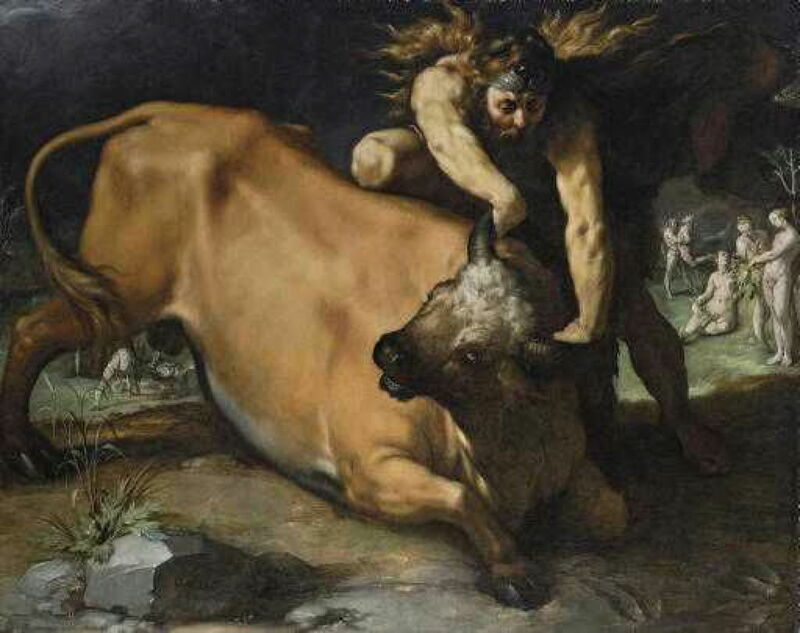 van Haarlem’s painting of Hercules and Achelous, probably from around 1590, shows a late stage in the wrestling, with Achelous in the form of a bull, brought to the ground by Hercules, who is here trying to twist his horns off. This painting was confiscated by the East German Government in 1985, and was only restored to its owner in 2008. 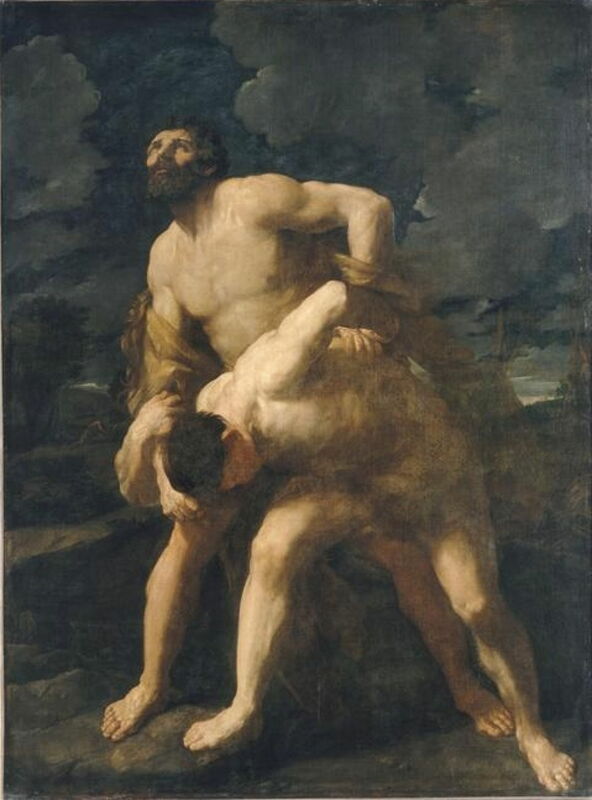 Guido Reni (1575–1642), Hercules and Achelous (1617-21), oil on canvas, 261 x 192 cm, Musée du Louvre, Paris. Wikimedia Commons. Guido Reni’s Hercules and Achelous (1617-21) opts for a more conventional wrestling match, with Achelous still in his first, human form. 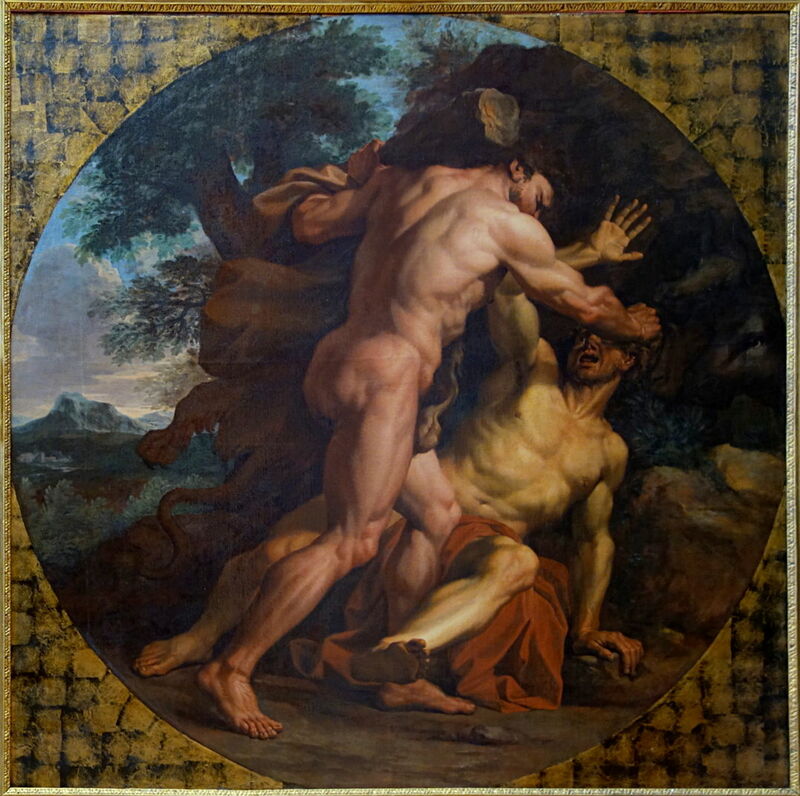 Noël Coypel (1628–1707), Hercules Fighting Achelous (c 1667-69), oil on canvas, 211 × 211 cm, Palais des Beaux-Arts de Lille, Lille, France. Wikimedia Commons. Noël Coypel, the father of the better-known history painter Antoine Coypel, painted Hercules Fighting Achelous in about 1667-69. This too opts to show the pair during the first phase of their fight. In addition to wearing his lionskin, Hercules wields his fearsome club, although Ovid doesn’t refer to its use on this occasion. Nicolas Bertin (1667–1736), Hercules fighting Achelous (1715-30), oil on canvas, 108 × 137 cm, Muzeum Narodowe w Warszawie, Warsaw, Poland. Wikimedia Commons. 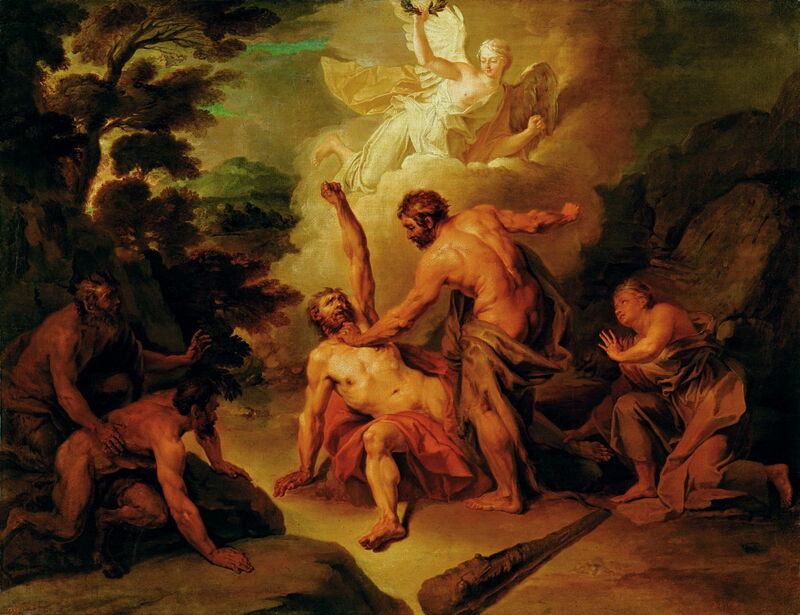 Nicolas Bertin’s Hercules fighting Achelous (1715-30) is more elaborate. Hercules has almost got Achelous onto the ground, and looks as if he is about to punch him with his right fist. Hercules’ club rests in the foreground. The woman at the right is Deianira, over whom they are fighting, and a winged goddess is ready to place the laurel wreath on the victor. For once, the most detailed and magnificent painting of one of Ovid’s myths is quite modern, painted in 1947 for a department store in Kansas City. Thomas Hart Benton’s Achelous and Hercules (1947) is a real gem of narrative painting. At the centre, Hercules, stripped to the waist and wearing denim jeans, is about to grasp Achelous’ horns. Immediately to the right, Deianira is shown in contemporary American form too, with a young woman next to her bearing a laurel crown. They are sat on the Horn of Plenty – and Benton is the only painter here to have included this important reference. To the left of centre, Benton shows a second figure of Hercules holding a rope, making this multiplex narrative. That figure is part of a passage which refers to ranching and cowboys, and further to the left to the grain harvest. To the right, the Horn of Plenty links into the cultivation of maize (corn), the other major crop from the area. Who claimed that narrative painting was dead by the twentieth century? It is also worth noting that each of the paintings of the Feast of Achelous showed a Horn of Plenty containing fruit for the ‘second course’. 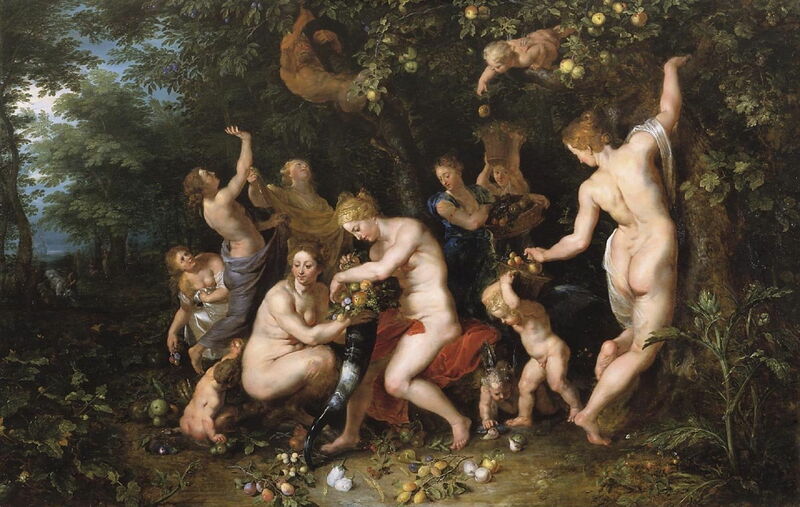 Peter Paul Rubens (1577–1640) (workshop) and Jan Brueghel the Elder (1568–1625), Nymphs Filling the Horn of Plenty (c 1615), oil on panel, 67.5 x 107 cm, Koninklijk Kabinet van Schilderijen Mauritshuis, The Hague, The Netherlands. Wikimedia Commons. My final painting to accompany this short story is another collaboration between the workshop of Peter Paul Rubens and Jan Brueghel the Elder: Nymphs Filling the Horn of Plenty (c 1615). Although it has no references to the fight between Hercules and Achelous, it’s good to see the staff preparing the second course of Achelous’ banquet. Posted in General, Language, Life, Painting and tagged Benton, Bertin, Brueghel, cornucopia, Coypel, Fontana, Metamorphoses, myth, narrative, Ovid, painting, Reni, Rubens, van Haarlem. Bookmark the permalink.